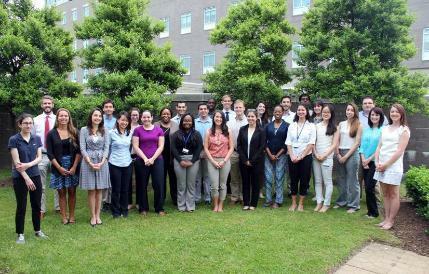 The Summer Scholars Program is a mentored research internship offered by EVMS Pediatrics at Children's Hospital of The King's Daughters in Norfolk, Virginia. The competitive 11-week program is open to college seniors (rising or graduating) and first- or second-year graduate or medical students who are exploring potential careers in medical, biomedical, public health or behavioral research. Students chosen for the program will conduct a preselected research project, from start to finish, and present their project outcomes to the scientific community. Students are listed as co-investigators on their projects, which are frequently published and presented on the national level. This summer experience includes formal classroom training and personalized application in research design, implementation and publication and can greatly benefit those considering a career in research. Review the 2018 Summer Scholars project summary. Review more information about the program. Student applications for the 2019 Summer Scholars program are now closed. Please refer back to this webpage on Dec. 1, 2019 to access the application for the 2020 Summer Scholars program. Project submissions for the 2019 Summer Scholars program are now closed. Please refer back to this webpage on Dec. 1, 2019 to access the project submission form for the 2020 Summer Scholars program.